Read our comprehensive prediction on who will win? 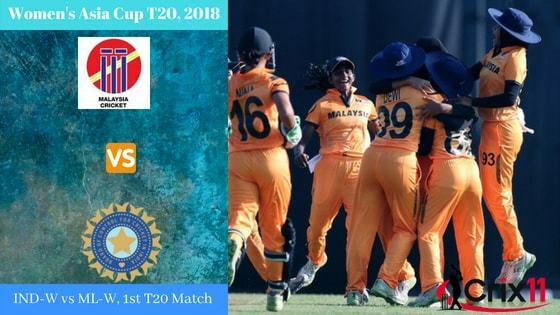 In Today’s Dream11 Cricket Match Prediction of IND-W vs ML-W T20, Women’s Asia Cup T20, 2018, we will cover likely playing 11, pitch report Kinrara Academy Oval, Kuala Lumpur and toss prediction. We will also cover players recent and past performance, all the latest news and updates of India Women Team and Malaysia Women Team, weather report of Kuala Lumpur, dream11 best teams, key players, the best choice for captain and vice-captain, dream 11 guru and crictom expert prediction, where to watch the live match of ML-W vs IND-W and details of live streaming. All the details in this post are well researched and taken from very reliable sources. Make sure to read the complete post to get 100% benefit. Each and every section of the post has some important tips, tricks and suggestions of fantasy leagues so make sure to read the complete post. To win in any fantasy leagues like dream11 or myteam11, you should have the above details and the best part is, you will get all the details in crix11.com. You just need to make your own teams. Our strategy is very simple, we predict the match, the players perform and our readers win. Where Can You Watch the Live Streaming of INDW vs MLW, 1st T20 Match or Channels to Watch? Who Will Win the 1st T20 Match Between INDW vs MLW and Toss Prediction? What is the best combination of players for Dream11 and Fantasy Leagues for 1st T20 Match? Match: Women’s Asia Cup T20, 2018, 1st Match INDW vs MLYW. Time: 01:30 AM GMT, 07:00 AM IST. The pitch of Kuala Lumpur, Kinrara Academy Oval will have dodgy bounce and it will favour the fast bowlers. Two international matches were played on this ground. Both the matches were a low scoring match and the seamers got the maximum benefit. The wicket will also benefit the batsmen. If Malaysia Women bats first then a very low score is expected. 46/10, 56/10, 119/3 and 65/10, these are the previous score of ML-W. In Kuala Lumpur, it will be partly cloudy throughout the day but nothing to worry as no rain is expected today. The cricket fans and fantasy users can see the complete match. The temperature is expected to be 28-Degree Celsius and the humidity to be 69%, which may go down to 56%. The first match of India women vs Malaysia Women will be broadcasted on Star Sports Network. Star Sports has an exclusive Broadcasting Rights. If You are from India and want to watch the live match of IND-W vs ML-W 1st T20 Match, then you can watch it on Star Sports Network. In this section, we will provide you with the squad of India Women vs Malaysia Women for 1st T20. Smriti Mandhana, Jhulan Goswami, Mithali Raj, Harmanpreet Kaur, Poonam Yadav, Anuja Patil, Jemimah Rodrigues, Taniya Bhatia, Deepti Sharma, Pooja Vastrakar, Ekta Bisht, Veda Krishnamurthy, Rajeshwari Gayakwad, Shikha Pandey, Mona Meshram. Winifred Duraisingam, Yusrina Yaakop, Ainna Hamizah Hashim, Nadhirah Nasruddin, Dhanusri Muhunan, Noor Hayati Zakaria, Mahirah Izzati Ismail, Aina Najwa, Nur Arianna Natsya, Christina Baret, Mas Elysa, Wan Julia, Jamahidaya Intan, Zumika Azmi, Sasha Azmi. Malaysia Women has not performed well in recent times. Today will be a tough time for ML-W as they take on one of the best team(India Women). It will be interesting to see how both the teams make their playing 11 combinations. We will give you the probable playing 11 in the next section. India Women have lost their last three matches out of four matches in a couple of months ago. It will be a good chance for INDW to improve their result in today’s match. Mithali Raj, Smriti Mandhana, Harmanpreet Kaur and Jhulan Goswami have consistently performed. It will be interesting to see how Harmanpreet Kaur makes playing 11 combinations. Smriti Mandhana, Mithali Raj, Harmanpreet Kaur (c), Jemimah Rodrigues, Anuja Patil, Taniya Bhatia, Jhulan Goswami, Poonam Yadav, Pooja Vastrakar, Deepti Sharma, Radha Yadav/Shikha Pandey. Malaysia Women have lost their last three matches out of four matches and one match was a tie. Their performance was very poor and they will definitely want to improve today. Yusrina Yaakop, WA Duraisingam, Mas Elysa, and Christina Baret were top performers. It will be interesting to see how ML-W make their playing 11 combinations as they have included news faces in their squad. Yusrina Yaakop, WA Duraisingam (c), Mas Elysa, Christina Baret, Mahirah Izzati Ismail, J Intan, Nur Nadihirah, Ainna Hamizah Hashim, Nur Syazwina Hanim, Emylia Eliani, Sasha Azmi. Note: It was difficult to predict playing 11 of Malaysia Women. The team may be updated in the last hour. So please check the team once again before the deadline. Pro tips: You can take Christina Baret in your team over Taniya Bhatia as Baret is a top order batsman. Make a combination of the above players for multiple teams. Pro tips: The above players are most likely to perform. Make a combination of the above batsmen for multiple teams. Pro tips: The above players may contribute the most. You can take them as a captain and vice-captain. If you are looking for the winner of the 1st match then you are at right place as in this section we will give information about who will win. India Women is a strong team as compared to Malaysia women. According to our astrology prediction, IND-W will win today. ML-W will win the toss and ask INDW to bat first. Try To take more bowlers from India Women Team. Mithali Raj, Smriti Mandhana, and Harmanpreet Kaur are must have players in any fantasy teams. Try to make teams taking two scenarios. For example, if IND-W bats first them make a team and if ML-W bats first make a different team. Conclusion: This is it for Today’s Dream11 Fantasy Cricket Match Prediction of IND-W vs ML-W, 1st T20 Match, Women’s Asia Cup T20, 2018, which will be played on Sunday 3rd June. You can give your valuable feedback in the comment section. Subscribe to our notification of latest updates. GOODBYE!